To the Town of Harrison for its plan to transform 250 acres along the lower Passaic River into a mixed-use and transit-oriented development. The Town of Harrison in Hudson County is a small (1.2 square mile) community located opposite the City of Newark along the Passaic River. From its incorporation in the mid-1800s the town’s economic engine was heavy industry, with most of the manufacturing activity occurring in the southern third of its borders. By the late 1960s, the bulk of Harrison’s industry had moved out. From the mid-1970s to the 1990s, the town lost more than $150 million in ratables and was faced with a rapidly deteriorating and underutilized industrial area. It was at this time that Harrison, led by Mayor Raymond McDonough, made the economic redevelopment of this area its first priority. The town’s first approach was to try and re-market the industrial facilities to other industrial firms, but the town was unsuccessful. It soon became apparent that the area needed to be reconceived and re-marketed, so in 1997 Harrison began work on creating a local redevelopment agency and plan. In 1999, the Harrison Redevelopment Agency was up and running and looking for developers to invest in the area. 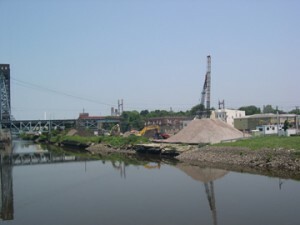 The result of this multi-year planning process coordinated between Harrison and five private developers is the 2003 Waterfront Redevelopment Plan (WRP). Its vision is to transform 250 acres of obsolete industrial facilities into a new, pedestrian-friendly, transit-oriented, mixed-use development along the banks of the Passaic River. The WRP creates a 20-year framework that will integrate approximately 6,500 new residential units, 3.4 million square feet of office space, 1.2 million square feet of retail space, an entertainment complex with a soccer stadium, as well as public waterfront recreation areas with the existing population of nearly 14,500 people. 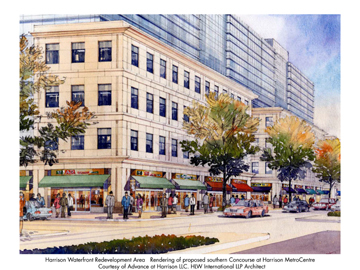 The Waterfront Redevelopment Plan is consistent with State Plan guidelines for Metropolitan/Planning Area 1 regions and the area is a designated development node in the Hudson County Strategic Revitalization Plan. The 250-acre site is located in the midst of existing residential, commercial, office uses in Newark and Harrison, as well as existing community facilities. It builds upon the existing infrastructure of the area, including roads, public transportation, water, and electric and sewer facilities. This infrastructure will be upgraded as part of the redevelopment, in order to accommodate the higher densities and new uses in the area. The Plan when fully implemented will result in the creation of approximately 6,500 new residential units in a variety of housing types and sizes including studio, 1-bedroom and 2-bedroom apartments, townhomes and condominiums. There will be a wide range of market rate pricing options. All new housing, jobs, shopping, entertainment and recreational opportunities will be within walking distance of a PATH station linked to the state’s transportation network. Additionally, all new development will occur within walking distance of new parks and open spaces. The projected area densities support a pedestrian-friendly environment. Residential density is expected to be more than 25 residential units per acre, the commercial floor area ratio (FAR) exceeds 5.0, and 15 percent of the land area is slated for open space. A high-quality pedestrian realm is ensured by innovative bulk and design standards that require these higher densities and the mix of land uses as well as the creation of public spaces for public interaction. Virtually all parking is required to be located within structures and will be as visually unobtrusive as possible. Entryways to parking structures are also required to be from secondary streets to limit the impact upon the pedestrian environment. Key design features of the Plan include the construction of a public waterfront walkway along the Passaic River and two separate concourses linking public spaces and attractions within the area. The plan establishes a pedestrian-friendly, transit-oriented land use pattern to capitalize upon mass transportation availability and the area’s position astride the regional road network. The Plan builds upon these assets with a new road network with on-street parking, wide sidewalks, traffic calming and street trees. Several options have been identified that would improve transportation linkages, including reopening the commuter rail station along the Morris Essex line, improving access to Route 280, and constructing a new bridge across the Passaic River to Newark. The intent is to create a vision for a 21st century urban space with a wealth of transportation options. A core design feature of the Waterfront Redevelopment Plan is the physical and social restoration of the Passaic River, one of the State’s most abused and underutilized waterways. The plan not only enhances a critical environmental area, but it also creates new public open space via a series of parks and green spaces along the river, linked by a waterfront walkway promenade. This multi-functional urban greenway includes features to control flooding, increase public access and restore sensitive stream bank areas. The Plan also proposes a diverse strategy to remediate the many brownfield areas for use with new construction, adaptive reuse as well as open spaces. The Plan contains extensive architectural and landscape design standards to ensure attractive, sustainable, energy-efficient construction. The Plan goes as far as to establish urban forestry guidelines to ensure the sustainability of new street tree plantings. One of the most exciting aspects of Harrison’s Waterfront Redevelopment Plan is that it is already being implemented. To date, there are five developers under contract, one of which has already begun construction on a hotel that is scheduled to open in July 2004. 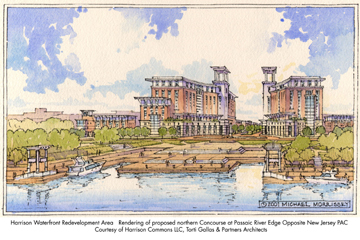 It will be through the cooperation and shared vision of all involved parties – governing body, Redevelopment Agency, residents, and developers – that Harrison will be able to transform its economic base and provide all residents with a long-sought connection to the Passaic riverfront.